Tennessee head coach Jeremy Pruitt has never coached offense as his primary focus at the collegiate level. Pruitt has always been a defensive-minded coach since he’s been in the collegiate ranks. But as a head coach, he has to focus on more than just the defense. The Vols’ offense and special teams also require his attention. The Vols’ offense has struggled to start this year, and Pruitt has caught the attention of Vol fans over the last two weeks with where he’s been positioned at practice. 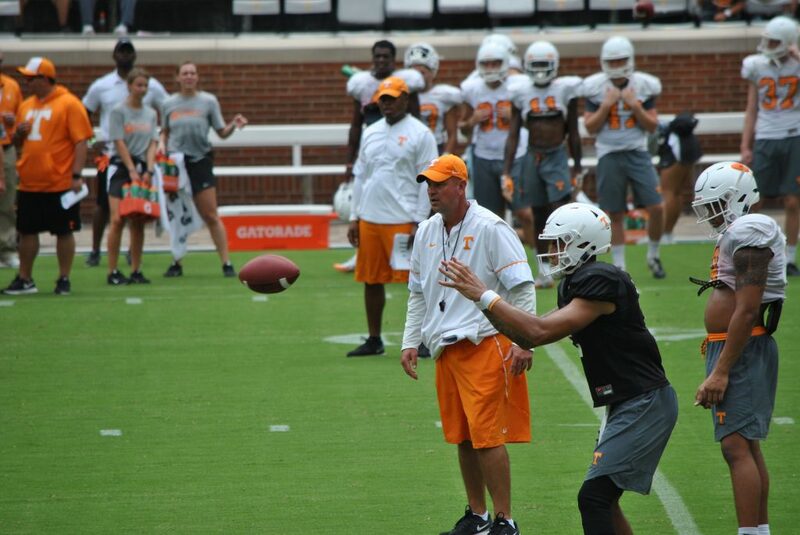 Pruitt has typically spent most of his time with UT’s defensive players and coaches during the open portions of practice this year, but lately he’s been keeping an eye on the offense. Vol fans were beginning to wonder if Pruitt was losing faith in offensive coordinator Tyson Helton after the slow start to the season and with the offense’s performance specifically against Florida and Georgia. But Pruitt explained after practice on Wednesday that the timing was just coincidental. The first-time head coach stated that he has faith in his defensive coaches, and he’s simply exercising his responsibilities as head coach by checking in on the areas he’s not as familiar with. He trusts cornerbacks coach Terry Fair and safeties coach Charles Kelly to help manage the secondary and defense when he’s not over there, and that frees him up to check on other parts of the team. “I have confidence in coach Terry Fair. I have confidence in Charles Kelly. I don’t think I have to be down there,” Pruitt told reporters after practice on Wednesday. “I knew when we got started to make sure that it was exactly the way I wanted it. Even though me and Charles speak the same language, I wanted to make sure to start off that’s the way it was. When we first started, I ran all the defensive meetings. I don’t run all the defensive meetings anymore. Even though a lot of us worked together, we hadn’t worked together in a couple of years, so you want to make sure that you’re all speaking the same language defensively. So a lot of it has to do with that, and I spent so much time on the defensive side. Pruitt has a lot of familiarity with Tennessee’s defensive staff, but he’s also worked with the Vols’ offensive coaches before as well. He explained on Wednesday that he knew Tyson Helton back in 2004 while he was still at Hoover High School, and he roomed with offensive line coach Will Friend in college. Tight ends coach Brian Niedermeyer served under Pruitt as an assistant at both Georgia and Alabama, and running backs coach Chris Weinke was an off-field assistant for Alabama while Pruitt was there as well. There’s familiarity with everyone on Pruitt’s staff with the exception of wide receivers coach David Johnson. But even with Johnson, Pruitt got confirmation from someone he trusts before he hired him. Burton Burns, the running backs coach and associate head coach for Alabama, highly recommended Johnson. Pruitt stated that the Vols have “great offensive minds” on the staff. But he’s still not pleased with what he’s seen from the offense so far this year. “To be good on offense, you’ve got to be able to execute. That’s the one thing,” Pruitt explained. “Defensive football, you know, there’s lots of times over the years we didn’t exactly get it right (as coaches). But we had some really good play-makers, some guys that, most of them got it right. On offense, it’s hard to have success unless everybody’s doing it right, you know? We’ve got to work to do that. The Vols have done a better job this season compared to last year of creating big plays, but they’ve also allowed far too many negative plays on offense. Tennessee only had 18 plays of 30 or more yards all of last season, and they already have 12 such plays this year. They’ve already surpassed their total plays of 50 or more yards this year (6) than they had in 12 games last season (4). But for all that explosive power, the Vols have been just as bad when it comes to allowing negative plays. UT is last in the SEC in tackles for loss allowed per game, giving up 7.6 tackles for loss per game. Not only is that last in the SEC, but it’s tied with Nebraska and San Jose State for 115th out of 130 FBS teams. Pruitt isn’t micromanaging the Vols’ offense, but he isn’t happy with the inconsistency on the offensive side of the ball either. Tennessee will need to find ways of executing better in the coming seven weeks if they want to get a win in conference play. Are Vols Finally Seeing a Leader Emerge?